This summer, I got a divorce. Which, hey, is not something I thought would be included in any how-I-spent-my-summer-vacation essay. Of course, the divorce started many years ago, before I even fathomed it happening. It started before my youngest was even born, a toxin of bad choices, cowardice and inconsiderations that ebbed and flowed into the relationship until divorce was the only option. A complete absolute. A welcome relief. Last summer was much better than that spring, or that winter, or that fall. This summer, I saw Yosemite for the first time. I vacationed with friends and family. I let myself Not Write. I climbed mountains with my kids. I had exhilarating sparks ignite in my career. I stood up for myself and refused to be mistreated. We swam swam swam. My eight-year-old told me it was the best summer of her life, and as sad as it was to drive my kids to a far away park and share the news they already knew was coming, this summer is also something I’ll look at with fondness. I got myself through, I got them through, and at the end of summer was something wonderful: FALL. This fall, I watched oodles of Gilmore Girls. I got back to work. I said yes to a project that was exactly the kind of thing I’ve wanted to work on for years. I traveled. I connected with old friends. I dated boys who liked things about me I had forgotten were there. I worked out. I quit working out. I leaned on my family. I worked with my girls on their jumbled emotions. Most importantly, I laughed again. I didn’t realize I’d lost my laugh, but there it was, all high-pitched and joyous. Fall was glorious. The only thing better would be: WINTER. This winter, I did every flipping holiday thing with my kids I could think of. I started new traditions and stayed true to the old. I had, quite surprisingly, the best Christmas I’d had in years. I met my editor(s!) in NYC. I went to therapy. I had some parenting wake up calls. I had some parenting victories. Mostly, I parented. Now it’s a new year, with more mysterious seasons ahead. Mylanta, I’m excited. There were some horrible detours, but now I feel in control and free and so so alive. 2015 is the first year in five that I haven’t had a book release, so instead I want to spend some more time blogging again, starting with a post I put up on Facebook to announce the big D.
Yep. I have a flair for drama. It was cathartic as all get up to articulate these feelings precisely as I was feeling them. Divorce is still a part of my day to day life. I have to interact with a person I would rather never communicate with again. It’s the nature of co-parenting, no matter what custody arrangements were made. On the other hand, so many of these emotions and struggles seem very far away, a lifetime ago. A chapter I’m glad to end in a book I never even wanted to write. So anyway. Here. Read. If you are in the same boat, I hope this helps. If you are not in the same boat, more power to you, nurture the crap out of those you love. Nurture regardless. Forgive. Grow. Learn. Love. It’s okay to be vulnerable. It’s okay to ask for help. It’s okay to cry in the Taco Bell drive-through. It’s okay to be honest, even if everything and everyone in the world feels false. It’s okay to expose your scars. It’s okay to admit when you’ve been judgmental, or naive, or just plain wrong. It’s okay to laugh at the most agonizing of absurdities. It’s okay to rage. It’s okay to try and try and still try. It’s okay to blossom in the poorest of soil. Did I mention that it’s okay? There’s a fine line between honesty and professionalism, and I probably cross it more times than I should. I text my editor pictures of churros at Costco, because she’s my friend, and those churros are things that should be documented. The first conversation I had with my publicist was about a major life crisis and possibly feeding me green M & M’s at my signing. In relationships of any kind, I value authenticity and integrity. Yes, I write fiction for a living, but I write to reveal emotional truth. All truth. I hunger for truth. So I know this is a bold forum, but my options are limited. I’m not Gwyneth Paltrow and I don’t have access to her website, Goop. That’s right. It’s a conscious uncoupling. Or as us non-Goopy folk call it, a straight-up divorce. Imagine typing that. Imagine SAYING that. Out loud. Even in an attorney’s office, discussing cold words like assets and fault, I would whisper “the D word”. I thought the D word was for other people—people who didn’t try hard enough or love big enough or just… weren’t enough. Trust me. It takes oodles of therapy to fall from and gloriously reclaim enough. We are all galaxies beyond ENOUGH. When I committed to this marriage, I signed up for forever. I was 19 when I made that choice, and if I could go back, 19% of the time I would still say yes to that proposal. No, 100%–I got three remarkable children out of the deal. When this marriage began, my ex-husband was in love with me, and I was in love with him. We went to prom together. Lived through 11 years of advanced schooling, 8 moves, 3 babies. We formed joint friendships and bank accounts, became a part of each other’s families, started a business. And we were a “we”. But toxic choices were made and destructive things happened that tore that “we” apart—tore me apart. “We” chose blatantly different paths, different lifestyles. In the end, my decision was easy. I resolved to stay true to who I am. As a result, my ex lost my family—my supportive, loyal family. I lost a relation to caring and sweet in-laws. I’ve grieved for him, for me. I’ve grieved for everyone involved. The D word is awful, sad, and something no one should ever have to utter, especially to their children. Especially. That said, Divorce (capitalized!) is my new favorite word. We are here on earth to be tried, but we are also here to be blessed. And I can’t even begin to count the tender mercies and clear-cut miracles that I’ve witnessed. I’ve never been more assured of God’s existence than in the dark, deep crevices of divorce. He is there—always—in every trial, prayer, tear, breath or signature. I’ve had friends show up at my house just to listen, clean, or force-feed me chicken wings. My family and church have helped me discover strength that I never imagined possible. My children have been children… innocent, imaginative and the reason I get out of bed every morning. The pieces of me are syncing right back together. A few more chicken wings and I’ll be whole. Better than whole. I am ready to soar. What I’ve learned: People are kind. We take risks for others. We want each other to succeed, and when that doesn’t happen, we cushion the falls. The people in my life—and in my ex’s life—will never, ever know how much their efforts have radiated the bleakest of days. As David Bednar said, “If you are in a totally pitch dark room and there is the smallest element of light, then that light chases the darkness. The darkness can not overrule the light.” So you. Yes, you. Thank you for your light. You took a blowtorch to that darkness. Put that blowtorch down and pat yourself on the back. Now let’s hug it out. Next up? The future. I want my ex to find a happy, new normal. I always have and always will wish him health, peace and truth. The bad doesn’t completely erase the good. Together we have these tender girls. I want him to keep living, keep working, keep parenting, keep loving, keep praying, keep hoping, keep trying. He is a child of God, and God wants us all to know joy. True joy. As for my new normal, I’m relieved and excited that I have more stories to write, relationships to build, children to love, people to serve and experiences to gain (and weight. Dude, I know. Divorce diet is no joke). I still want to notice the sunsets and forgive the mistakes. Instead of being a Mrs, I am now the mysterious Ms. Lindsey Taylor Leavitt. Y’all know I shall rock that Ms. title with irreverence and glee. If my new relationship status is the elephant in the room for any of you, then I’m hanging tinsel on that elephant and starting a Congo line. Friends, this is life, and life dances on. So to end this super long, rambling post which was probably not what you thought you’d find on your facebook feed this fine Tuesday (sorry, I’ll post a pic of dancing cats on Wednesday. Or maybe a dancing giraffe? Who doesn’t love a twerking giraffe? ), I just want to say thank you for your support, respect, and not probing that ever elusive “why?” Trust me, I’ve asked this plenty. It’s a thorny rabbit hole and it doesn’t do anyone much good—especially my kids. The Leavitt girls are warriors, but I’d like us to step out of this arena with minimal bruising on our futures and roaring applause in our souls. PS—And yes, I love the irony that I wrote GOING VINTAGE and I’m using a social network to announce this. Oh… life. 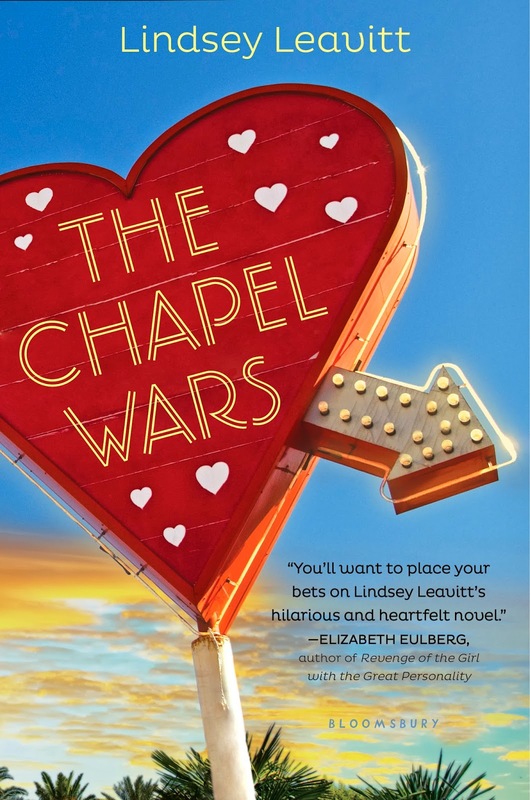 The Chapel Wars is out May 6. And it’s May NOW. And it will be MAY when I go on tour with many other Bloomsbury authors. Where? Glad you asked. And you must check out the adorable tumblr Bloomsbury set up to celebrate The First Loves tour. I’m sure you can be creative. Thanks, I like you a lot!! Yes, I know that has no relevancy to my topic, but that song’s been stuck in my head and I wanted to share. You’re welcome, those alive in the eighties. PROM THROUGH THE AGES!!!! Yes. It was as amazing as it looks. No, I can’t name everyone. Well, I can, but it takes SOO long to type. I’m in there somewhere. Doing something. And I’ve done other things lately, like began writing a book for National Novel Writing Month, which might be the worse thing I’ve ever done. Or the best. We’ll see. But that’s not why you’re here, right? You’re really here because you want to see my new book cover. Maybe even hear about this mysterious book. Chapel? Is this book religious? Wars? Is it violent? No and no. You’re getting another Lindsey Leavitt book with my trademark Lindsey Leavittness-which according to my publisher is humor and heart. Although I must say, this one starts with someone dead, so The Funny is a little more respectful of such circumstances. And The Angst is perhaps more amped up. But The Awesome? It’s all in there. Or as in there as I am able. This was a brutal writing and personal year for me, which is why I haven’t been online as much as usual. I’m glad to come out of it with a book of which I am very proud. I imagine this book is the closest I will ever come to understanding natural childbirth. But, you know, in a good way. And then there’s Grandpa’s letter. Not only is Holly running the business with her recently divorced parents, but she needs to make some serious money—fast. Grandpa also insists Holly reach out to Dax, the grandson of her family’s mortal enemy and owner of the cheesy chapel next door. No matter how cute Dax is, Holly needs to stay focused: on her group of guy friends, her disjointed family, work, school and… Dax. No wait, not Dax. And this is one of my favorite publishing peeps said about it…. 1. I’m coming at you from my new office, which is 78% done. I will post pictures as soon as I’m 100% and ready to show off all the loveliness (also, once my office is, erm, clean. So it might be awhile). But in the meantime, here is a messy sneak peak, taken from my comfy leopard-print writing recliner. You read all those words right. 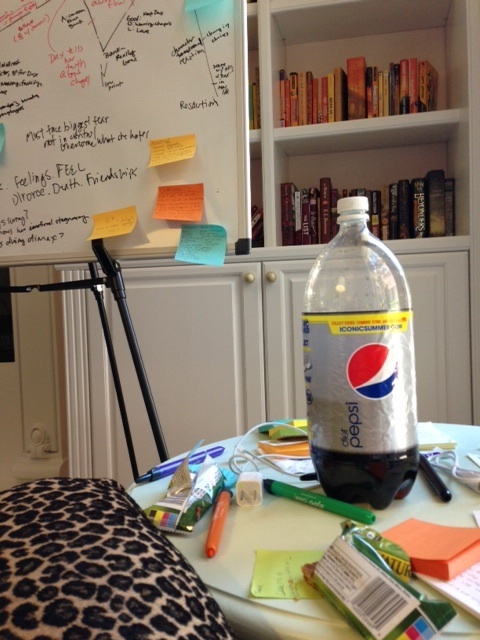 That white board is my next novel, which I’m hard at work on right now. It’s also my 9-year-olds favorite place to leave me notes, which is cute until she erases a major plot point. I’m living off a diet of pepsi and granola bars, which is far healthier than my diet for my last book–cheetos and, well, pepsi. Yes, my keyboard still has orange stains from those days. And those bookcases. I can’t wait to show you the full glory of those bookcases. 3. GOING VINTAGE ebook is on sale for $2.99. Barrrrrrgain, yo. It’s been up a few days, so not sure how long the sale runs. I love summer ebook sales! 4. 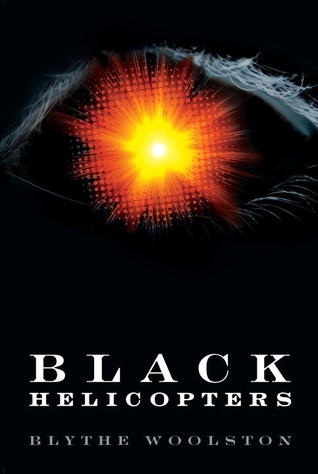 Oh, and speaking of helicopters, I am woefully behind on my reading, but Hawaii did give me time to catch up, and I’m so glad I finally got to devour (literally, in 2 1/2 hours), Blythe Woolston’s gripping BLACK HELICOPTERS. (I read it after the helicopter ride. Inspired, I guess). It’s one of the books I don’t want to summarize, just.. read it. At only 100 something pages, it’s good at showing a lot without having too say much, and the suspense was something else.